A love story that crosses centuries...and hangs by a thread. "By warp and weft I bind thee..."
Tessa Brody doesn't believe in magic. Or Fate. But all that changes the day she discovers a dusty unicorn tapestry in a box of old books The wild, handsome creature woven within it draws Tessa, and frightens her too. When she pulls a silver thread from the tapestry, Tessa accidentally releases a terrible secret-one that has been contained for centuries. She also meets William de Chaucy, a young sixteenth-century nobleman with gorgeous eyes, an odd accent and haughty attitude to spare. 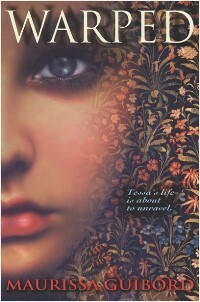 His fate is as inextricably tied to the tapestry as Tessa's own. Together with Will, Tessa must overcome a crafty, ancient enemy. That is, if she can get along with "his lordship" long enough. And do it before her whole life unravels. 0 Response to "Upcoming Release: Warped"